God's Light to the world. 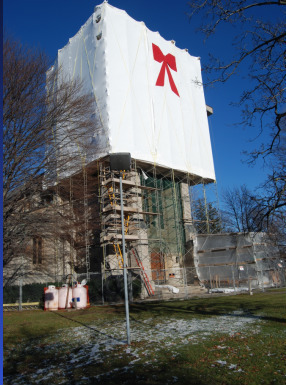 After years of planning and tireless fund raising concluding with the highly successful Tower of Faith campaign, Bero Architecture of Rochester was retained to prepare contract documents to begin the restoration of St. James’ historic bell tower. A contract was signed with Catenary Construction, Inc. in August, and the long anticipated restoration project was underway. 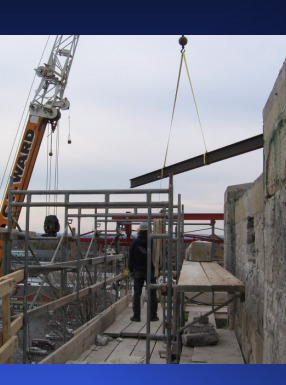 Scaffolding was erected on three sides of the 81 foot tower and work was started, consisting of repointing of interior and exterior stone masonry, replacement of decorative cast stone, replacement of the tower roof, upgrading of the storm drainage system and construction of a drywell. The contractor’s bid price was quite favorable and additional savings were realized as the work was progressed. Also, fund raising had continued and two very significant grants were received by St. James in the fall; a Pepsi Challenge grant for $50,000 and a Sacred Sites grant for $40,000. 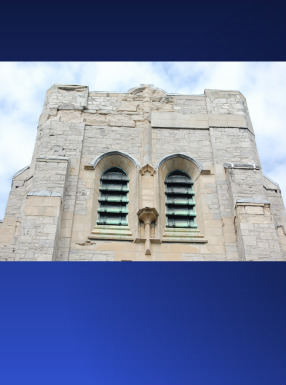 In late October, the Vestry approved project change orders as recommended by the Restoration Committee, increasing the scope of the work to include the erection of scaffolding on the north side of the tower and enclosing and heating the scaffolding to allow for winter construction activities. The change orders also extended the work further down the tower, taking full advantage of the scaffolding and available funding. Work is progressing on schedule with anticipated completion by Easter Sunday, 2012. We are very grateful for the dedicated efforts of many people, both within the parish and in the community-at-large, who have contributed to the success of this project. stewards of that which has been entrusted to them.